Backdropped by Earth, Discovery approaches the ISS during rendezvous & docking operations. STS-133 left Leonardo (named after the famed Italian Renaissance inventor Leonardo da Vinci), one of the three Multi-Purpose Logistics Modules (MPLMs), on the space station as a Permanent Multipurpose Module (PMM). PMM Leonardo added much-needed storage space on the ISS, and was launched with a near-full load of payloads. The construction of the Leonardo MPLM by the Italian Space Agency commenced in April 1996. In August 1998, after the completion of primary construction, Leonardo was delivered to the Kennedy Space Center (KSC). In March 2001, Leonardo made its first mission on Discovery as part of the STS-102 flight. The liftoff of Leonardo inside Discovery's payload bay on STS-102 marked the first of seven MPLM flights prior to STS-133. With the landing of Discovery after the STS-131 mission, Leonardo was transferred back to the Space Station Processing Facility at Kennedy Space Center. Leonardo began receiving modifications and reconfigurations immediately to convert it for permanent attachment to the space station and to facilitate on-orbit maintenance. Some equipment was removed to reduce the overall weight of Leonardo. These removals resulted in a net weight loss of 178.1 lb (80.8 kg). Additional modifications to Leonardo included the installation of upgraded multi-layer insulation (MLI) and Micro Meteoroid Orbital Debris (MMOD) shielding to increase the ability of the PMM to handle potential impacts of micrometeoroids or orbital debris; a Planar Reflector was installed at the request of the Japanese Space Agency (JAXA). Following berthing to the space station, the contents of Leonardo were emptied and moved to appropriate locations on the ISS. Once JAXA's Kounotori 2 (HTV-2) arrived in February 2011, Leonardo's now-unnecessary launch hardware was transferred to HTV2 for ultimate destruction in Earth's atmosphere. Activities to reconfigure Leonardo following STS-133 spanned multiple station crew increments. The Express Logistics Carrier (ELC) is a steel platform designed to support external payloads mounted to the space station starboard and port trusses with either deep space or Earthward views. On STS-133, Discovery carried the ELC-4 to the station to be positioned on the starboard 3 (S3) truss' lower inboard passive attachment system (PAS). The total weight of the ELC-4 is approximately 8,235 pounds. The Express Logistics Carrier 4 (ELC-4) carried several Orbital Replacement Units (ORUs). Among these were a Heat Rejection System Radiator (HRSR) Flight Support Equipment (FSE), which takes up one whole side of the ELC. The other primary ORUs were the ExPRESS Pallet Controller Avionics 4 (ExPCA #4). The HRSR launching on ELC4 was a spare, if needed, for one of the six radiators that are part of the station's external active thermal control system. Discovery carried the humanoid robot Robonaut2 (also known as R2) to the International Space Station (ISS). The microgravity conditions aboard the space station provide an ideal opportunity for robots like R2 to work with astronauts. Although the robot's primary initial task is teaching engineers how dexterous robots behave in space, it may eventually, through upgrades and advancements, assist spacewalking astronauts to perform scientific work once it has been verified as functional on the space station. It was the first humanoid robot in space, and was stowed on board the Leonardo PMM. Once Robonaut2 was unpacked, it began initial operation inside the Destiny module for operational testing, but over time, both its location and its applications could expand. Robonaut2 was initially designed as a prototype to be used on Earth. For its journey to the ISS, R2 received a few upgrades. Outer skin materials were exchanged to meet the ISS's strict flammability requirements. Shielding was added to reduce electromagnetic interference and onboard processors were upgraded to increase R2's radiation tolerance. The original fans were replaced with quieter ones to accommodate the station's restrictive noise environment, and the power system was rewired to run on the station's direct current system. Tests were conducted to make sure the robot could both endure the harsh conditions in space and exist in it without doing damage. R2 also underwent vibration testing that simulated the conditions it would experience during its launch onboard Discovery. The robot weighs 300 pounds (140 kg) and is made out of nickel-plated carbon fiber and aluminum. The height of R2 from waist to head is 3 feet 3.7 inches (100.8 cm), and it has a shoulder width of 2 feet 7.4 inches (79.8 cm). R2 is equipped with 54 servo motors and has 42 degrees of freedom. Powered by 38 PowerPC processors, R2's systems run at 120 volts DC. Space Shuttle Discovery also carried the Developmental Test Objective (DTO) 701B payload using Advanced Scientific Concepts, Inc.'s DragonEye 3D Flash light detection and ranging (LIDAR) sensor. The addition of the pulsed laser navigation sensor was the third time a Space Shuttle provided assistance to the commercial space company SpaceX, following STS-127 and STS-129. The DragonEye on STS-133 incorporated several design and software improvements from the version flown on STS-127 to provide increased performance. Its inclusion on STS-133 was part of a final test run ahead of being fully implemented on SpaceX's Dragon spacecraft, which had its maiden flight in December 2010. The navigation sensor provides a three-dimensional image based on the time of flight of a single laser pulse from the sensor to the target and back. It provides both range and bearing information from targets that can reflect the light back such as the pressurized mating adapter 2 (PMA2) and those on the station's Japanese Kibo laboratory. The sensor was installed onto Discovery two weeks later than planned, following a laser rod failure during testing. STS-133 carried the signatures of more than 500,000 students who participated in the 2010 Student Signatures in Space program, which was jointly sponsored by NASA and Lockheed Martin. The students added their signatures to posters in May 2010 as part of the annual Space Day celebration. Through their participation, students also received standards-based lessons that contained a space theme. Student Signatures in Space has been active since 1997. In that time, nearly seven million student signatures from 6,552 schools were flown on ten Space Shuttle missions. Also carried aboard Discovery were hundreds of flags, bookmarks and patches which were distributed when the shuttle returned to Earth. The mission also flew two small Lego Space Shuttles, in honor of an educational partnership between Lego and NASA. Astronauts also carried personal mementos including medallions with connections to their schools or military careers, as well as a William Shakespeare "action figure" from the English Department of the University of Texas, a stuffed giraffe mascot from the Hermann Children's Hospital at the University of Texas, T-shirts from Lomax Junior High School in La Porte, Texas, a blue Hawaiian shirt from NASA Johnson Space Center's Education Office, and a shirt from a volunteer fire department. 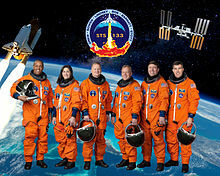 NASA announced the STS-133 crew on 18 September 2009, and training began in October 2009. The original crew consisted of commander Steven Lindsey, pilot Eric Boe, and mission specialists Alvin Drew, Timothy Kopra, Michael Barratt, and Nicole Stott. However, on 19 January 2011, about a month before launch, it was announced that Stephen Bowen would replace original crew member Tim Kopra, after Kopra was injured in a bicycle accident. All six crew members had flown at least one spaceflight before; five of the crew members, all but commander Steven Lindsey, were part of NASA's Astronaut Group 18, all being selected in the year 2000. The mission commander, Steven Lindsey, handed over his position as Chief of the Astronaut Office position to Peggy Whitson in order to lead the mission. For the first time, two mission crew members were in space when a crew assignment announcement was made, as Nicole Stott and Michael Barratt were aboard the ISS as part of the Expedition 20 crew. During STS-133, Alvin Drew became the last African-American astronaut to fly on the Space Shuttle, as no African-Americans were among the crews of STS-134 and STS-135. Having flown onboard Atlantis' STS-132 mission, Bowen became the first and to date the only NASA astronaut to be launched on two consecutive missions. The crew pose for a photo at the KSC (including Bowen). Mission poster (with Kopra instead of Bowen). Lindsey, far left, presents a montage to Barack Obama as crew members Barratt, Boe, Stott and Bowen look on. On 12 October 2010, the STS-133 crew arrived at the Kennedy Space Center to conduct the Terminal Countdown Demonstration Test (TCDT). The TCDT consisted of training for both the crew and the launch team that simulated the final hours up until launch. During the TCDT, the crew went through a number of exercises that included rescue training and a launch day simulation that included everything that would happen on launch day – except the launch. Commander Steve Lindsey and Pilot Eric Boe also performed abort landings and other flight aspects in the Shuttle Training Aircraft (STA). For the TCDT, the crew also received a briefing from NASA engineers, outlining the work that had been carried out on Discovery during the STS-133 processing flow. After successfully completing all the TCDT tasks, the crew returned to the Johnson Space Center on 15 October 2010. Flying aboard NASA T-38 training jets, the six astronauts returned to Kennedy Space Center on 28 October 2010 for final pre-launch preparations. The crew gathered for the Terminal Countdown Demonstration Test. Launch Pad 39A during the Terminal Countdown Demonstration Test. On 15 January 2011, Timothy Kopra, scheduled as the lead spacewalker for the mission at the time, was injured in a bicycle accident near his Houston-area home, reportedly breaking his hip. He was replaced by Stephen Bowen on 19 January 2011. The replacement did not affect the targeted launch date. This is to date the closest to a scheduled launch that a Space Shuttle crewmember has been replaced. During the Apollo program, Jack Swigert replaced Ken Mattingly three days prior to the launch of Apollo 13. 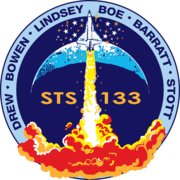 STS-133 was originally manifested for launch on 16 September 2010. In June 2010 the launch date was moved to the end of October 2010 and the mission was set to take place before STS-134, which in turn had been rescheduled to February 2011. STS-133 had the longest vertical flow period (170 days) since STS-35 (185 days). Discovery was moved from its hangar in the Orbiter Processing Facility (OPF)-3 to the nearby 52-story Vehicle Assembly Building (VAB) on 9 September 2010. The shuttle emerged from OPF-3 at 06:54 EDT and the rollover was done at 10:46 EDT when Discovery came to a rest in the VAB's transfer aisle. The quarter-mile trip between the OPF-3 and VAB was the 41st rollover for Discovery. The rollover was originally planned at 06:30 EDT on 8 September 2010. The move did not commence due to the unavailability of fire suppression systems because of a broken water main near the VAB and turn basin that runs out to the shuttle launch pads. The two SRBs were designated as flight set 122 by contractor Alliant Techsystems and were made up from one new segment and remaining segments reused across 54 earlier shuttle missions dating back to STS-1. Inside the VAB, engineers attached a large sling to Discovery and the orbiter was rotated vertical. The orbiter was lifted into the high bay where its external tank (ET-137) and boosters were waiting to be mated. During the mating operations, an internal nut pre-positioned inside the aft compartment of the orbiter slipped out of position and fell away inside the compartment. Engineers initially were worried that the orbiter would have to be removed from the ET and placed back in a horizontal orientation to make repairs. However, later they successfully accessed the area inside the aft compartment, and re-positioned the nut to complete the repairs. The bolting of the orbiter to its ET ('hard mate') was completed early in the morning of 11 September 2010 at 09:27 EDT. The shuttle's 44th rollout to the launch pad was scheduled to begin at 20:00 EDT on 20 September 2010. NASA sent out more than 700 invitations to shuttle workers so they could bring their families to watch Discovery's journey to the pad. However, the shuttle began the 3.4 mile trek from the VAB to the pad earlier than planned at about at 19:23 EDT on 20 September 2010. Discovery took about six hours to arrive at Pad 39A. The shuttle was secured on the launch pad by 01:49 EDT the next day. Discovery being lowered onto its external fuel tank and solid rocket boosters in High Bay 3 of the Vehicle Assembly Building. Space Shuttle Discovery attached to Launch Pad 39A on 21 September 2010. Discovery at Launch Pad 39A on 1 February 2011. Discovery is seen shortly after the Rotating Service Structure was rolled back on 23 February 2011. On 14 October 2010, engineers at the launch pad first discovered a small leak in a propellant line for Discovery's orbital maneuvering system (OMS) engines. The leak was detected after they noticed a fishy smell coming from the aft of the shuttle, thought of as a sign of fuel vapor in the air. Upon inspection, the leak was found at a flange located at the interface where two propellant lines met in Discovery's aft compartment. The line carried monomethyl hydrazine (MMH) propellant, one of two chemicals (the other is an oxidizer, nitrogen tetroxide) used to ignite the OMS engines. Engineers replaced an Air Half Coupling (AHC) flight cap. However, the new cap failed to solve the problem since vapor checks still showed signs of a leak. An aspirator was activated to collect the vapor at the leak-site allowing work to continue in other locations around the aft segment of Discovery. It was believed that the leak was in the crossfeed flange area – a problem with associated seals. On 18 October 2010, after an afternoon review, engineers were asked to double-check the torque on six bolts around the suspected leaky flange fitting and tighten if necessary. Subsequent leak tests showed again signs of seepage, and the task of solving the issue required the draining of both the left and right OMS tanks of the shuttle and a unique in-situ repair at the pad to avoid a rollback. On 23 October 2010, engineers completed the removal and replacement of the two seals on the right OMS crossfeed flange, after the education (a vacuum-related procedure, used to completely clear the plumbing of the toxic MMH) of the plumbing was completed ahead of the schedule by over a day. Later, testing indicated that the new seals were properly seated and holding pressure with no signs of additional seepage. Normal pad operations commenced soon after allowing managers to press forward with the confirmation of a 1 November 2010 target launch date, with fuel reloading into the OMS tanks beginning on the morning of 24 October 2010. On 2 November, while readying Discovery for launch, engineers reported an electrical issue on the backup Main Engine Controller (MEC) mounted on Engine No. 3 (SSME-3). Earlier in the morning, engineers said that the problem had been solved, however another glitch in the system raised concerns and additional troubleshooting was ordered. Troubleshooting followed and indicated the problem was related to "transient contamination" in a circuit breaker. NASA Test Director Steve Payne, addressing reporters, told that after troubleshooting and power cycles, the controller powered up normally. However, at the same time the problem was thought to be a non-issue, an unexpected voltage drop was observed. In a Mission Management Team (MMT) meeting held later that day, managers decided to scrub the launch for at least 24 hours to work towards flight rationale. A technician begins to remove the leaky GUCP's quick disconnect. On 5 November 2010, Discovery's launch attempt, a hydrogen leak was detected at the Ground Umbilical Carrier Plate (GUCP) during the fueling process. The plate was an attachment point between the external tank and a 17-inch pipe that carried gaseous hydrogen safely away from the tank to the flare stack, where it was burned off. All had been proceeding to plan with the tank "fast filled" during tanking, until the first leak indication was revealed. Firstly, a 33,000 ppm leak then reduced to a level below 20,000 ppm was recorded. The Launch Commit Criteria limit was 40–44,000 ppm. The leak was only being observed during the cycling of the vent valve to "open" to release the gaseous hydrogen from the tank to the flare stack. Controllers decided to stop valve cycling in order to increase the pressure and attempt to force a seal before attempting to complete the fast fill process. At this stage, the leak spiked and remained at the highest 60,000 ppm level (likely even at a higher value), indicating a serious problem with the GUCP's seal. Shuttle launch director Mike Leinbach characterized the leak as "significant," similar to what was seen on STS-119 and STS-127, although the rate was higher in magnitude and occurred earlier in the fueling process. Technicians begin to install a new GUCP on the external tank. After the day required to make the tank safe by purging remaining hydrogen gas with helium gas, NASA engineers prepared for disconnection of the vent arm and the significant number of lines prior to taking their first look at the GUCP. On the night of 9 November, technicians began disconnecting the GUCP by unhooking and lowering the hydrogen vent line. Teams performed an initial inspection of the flight seal and quick disconnect prior to sending them to labs for a thorough engineering analysis. Engineers reported an unevenly (asymmetrically) compressed internal seal and the quick disconnect hardware also seemed have a less concentric fit than pre-fueling measurements indicated. Inspections also confirmed the condition of the hardware did not match the observations documented when it was installed on the external tank inside the VAB. On the morning of 12 November, teams began installing a new GUCP and completed the GUCP work over the next two days. The new plate was previously fit checked on the external tank at the Michoud Assembly Facility and yielded substantially better concentricity values than was obtained with the old and removed GUCP. Technicians took extra measurements to ensure the best possible alignment of the newly installed GUCP. Teams began installing the flight seal and quick disconnect on 15 November. Technicians spray foam insulation on a section of repaired stringers. Additional inspection of the tank revealed cracks in foam insulation in the flange between the intertank and liquid oxygen tank. The cracks are believed to have occurred about an hour after super-cold propellants began flowing into the external tank for the 5 November launch attempt. The cracks in the tank were the first to be found at the launch pad. The insulation was cut away for additional inspection, revealing two additional 9-inch metal cracks on either side of an underlying structural rib called "stringer S-7-2". NASA managers then decided to cut away additional foam and observed two more cracks on a stringer known as S-6-2 adjacent to the two original cracks. They were found on the far left of removed foam on the flange area between the intertank and the liquid oxygen tank. However, these cracks appeared to have suffered less stress than the others found. No cracks were found in stringers on the right side. NASA suspected the use of a lightweight aluminum-lithium alloy in the tanks contributed to the crack problem. Repairs commenced while the shuttle remained on the pad. An environmental enclosure was erected around the known damage site to facilitate the ongoing repairs and eventually to apply fresh foam insulation. On 18 November, as part of the repairs, technicians installed new sections of metal, called "doublers" because they are twice as thick as the original stringer metal providing additional strength, to replace the two cracked stringers on Discovery's external tank. Scanning of the stringers on the liquid oxygen/intertank flange was completed on 23 November. NASA also performed backscatter scanning of the lower liquid hydrogen/intertank flange stringers on 29 November. Program managers identified the analysis and repairs that were required to safely launch the shuttle, and this analysis was reviewed at a special Program Requirements Control Board (PRCB) held on 24 November. Managers announced at that meeting that the launch window available in early December would be passed up, with a new target of 17 December set, but cautioned that the launch could slip into February 2011. After reviewing the space station's December traffic model following the realigned Johannes Kepler ATV's launch date, NASA had identified a potential launch window in mid-/late-December 2010. The 17 December 2010 date was preferred because it would have allowed the shuttle to carry more stored oxygen to the International Space Station to help it deal with oxygen generation issues, which the crew had dealt with for several months. "What we've told the agency leadership is that clearly we're not ready for the 3 December to 7 December window that's coming up next week," John Shannon, NASA's SSP manager, said in a news conference held after the special PCRB. "We'll leave the option open for a launch window for 17 December, but a lot of data has to come together to support that". The launch date of 24 February 2011 was officially set after the Flight Readiness Review meeting on 18 February 2011. Reviews of previous problems, including the GUP vent line connection, external tank foam and external tank stringer cracks, were found to be positive. Additionally, flight rules which required a 72-hour separation between dockings at the International Space Station threatened to delay the launch by at least a day due to the delayed launch of the ESA's unmanned Johannes Kepler ATV supply craft. Managers instead decided to press ahead with the countdown allowing for a possible standdown; had docking issues arisen with the ATV, STS-133 would have stood down for 48 hours. The Kepler ATV docked successfully at 10:59 UTC, 24 February 2011. All times Eastern Time, first 5 are while daylight saving time was in effect (EDT), attempt 6 is during outside of daylight saving (EST). Because of this, the final "turnaround" category should be 111 days, 2 hours, 49 minutes, it is not due to automatic formatting. 3 3 Nov 2010, 3:52:00 pm scrubbed 0 days, 23 hours, 34 minutes technical 2 Nov 2010, 5:40 am (T-11 built-in hold) 70% Electrical fault in backup SSME controller. 4 4 Nov 2010, 7:29:54 pm scrubbed 1 day, 3 hours, 38 minutes weather 4 Nov 2010, 6:25 am 20% Decision made at pre-tanking weather briefing to reset clock to T-11 hold and delay ~24 hours due to rainy conditions. 6 24 Feb 2011, 4:53:24 pm success 111 days, 1 hour, 49 minutes 90% The clock was held at T-5 minutes to allow time to resolve a computer issue at the Range Safety Officer's console. The issue was resolved and the clock restarted in time to allow Discovery to launch with just two seconds left in the launch window. Section source: NASA Press Kit and NASA TV Live The original nominal mission of twelve days was eventually extended by two days, one at a time. Space Shuttle Discovery successfully lifted off from Kennedy Space Center's Launch Pad 39A at 16:53:24 EST on 24 February 2011. Liftoff was initially set for 16:50:24, but was delayed for 3 minutes by a minor glitch in a computer system used by the Range Safety Officer (RSO) for the Eastern Range. Once Discovery was cleared for launch, it took 8 minutes and 34 seconds to reach orbit. At approximately four minutes into flight, a piece of foam was seen breaking away from the External Tank. This foam was deemed not to be a threat, since it was liberated after the shuttle had left Earth's atmosphere. During Discovery's ascent, NASA managers also reported that they saw three more additional instances of foam liberation. These losses also occurred after aerodynamic sensitive times when debris could seriously damage the shuttle, and so were deemed non-threatening. NASA's engineers accounted the foam losses to a condition called "cryo-pumping". When the external tank is loaded with liquid hydrogen, the air trapped in the foam first liquifies. During the ride into orbit, as the hydrogen level in the tank drops, it warms up and the liquefied air turns back into a gas. The pressure generated due to the state change of hydrogen can cause parts of foam in the tank to come off. Once on orbit, the crew of STS-133 opened the payload bay doors and activated the Ku band antenna for high-speed communications with Mission Control. While the Ku band antenna was being activated, Alvin Drew and Pilot Eric Boe activated the Shuttle Remote Manipulator System (SRMS), also known as the Canadarm. Later in the day, imagery of the External Tank during launch was downlinked for analysis. Space Shuttle Discovery rockets into orbit for the final time, 24 February 2011. STS-133 launch video (2 mins 32 secs). Discovery lifts off from Launch Pad 39A. Close up of the launch from Pad 39A. Flight Day 2 saw the crew of Discovery begin their preparations to dock with the International Space Station (ISS). The day started with a firing of the Orbital Maneuvering System (OMS) engine, called the NC2 burn, to help Discovery catch up to the ISS. Commander Steve Lindsey, Pilot Eric Boe and Mission Specialist Al Drew began the day performing an inspection of the Re-enforced Carbon-Carbon (RCC) panels with the Orbital Boom Sensor System (OBSS). Lindsey and Boe started the inspection on the starboard wing and nose cap, and continued on with the port wing; the whole survey took about six hours to complete. Drew joined up with Michael Barratt and Steve Bowen to checkout and get their two Extravehicular Mobility Units (EMUs) ready for the two spacewalks that would be conducted during the mission. Later in the day, the crew checked out the rendezvous tools to ensure they were operational. At the end of the day, another OMS engine firing, known as the NC3 burn, took place. The orbiter docked to the ISS on Flight Day 3, marking the 13th time Discovery had visited the ISS. The docking occurred on time at 19:14 UTC. A hard mate between the two vehicles was delayed by about 40 minutes because of relative motion between the station and shuttle, thus putting the crew behind the timeline for the day. The hatches were finally opened at 21:16 UTC, and the Expedition 26 crew greeted the crew of STS-133. After the welcome ceremony and safety briefing, the crew's main task of the day was to transfer the ExPRESS Logistics Carrier 4 (ELC-4). ELC-4 was taken out of Discovery's payload bay by the Space Station Remote Manipulator (SSRMS), also known as Canadarm2, which was operated by Nicole Stott and Michael Barratt. The SSRMS handed it to the Shuttle Remote Manipulator System (SRMS), which was being controlled by Boe and Drew, while the SSRMS moved to the Mobile Base System (MBS). Once there, the SSRMS took ELC-4 back from the SRMS, and installed it at its location on the S3 truss location. ELC-4 was installed in its final location at 03:22 UTC on 27 February. While the robotic transfer was going on, Bowen and Lindsey were transferring items that were needed for Flight Day 4 and the spacewalk on Flight Day 5. View of the nose, the forward underside and crew cabin of Discovery during the Rendezvous Pitch Maneuver. View of the aft portion of Discovery's main engines, part of the payload bay, vertical stabilizer and Orbital Maneuvering System pods during the RPM. Discovery shortly after docking with the International Space Station on 26 February 2011. The docked Discovery and Dextre are featured in this photograph. On Flight Day 4, Stott and Barratt grappled the Orbiter Boom Sensor System (OBSS) using the Canadarm2 and removed it from the starboard sill of Discovery's payload bay. Once it was grappled and out of the payload bay, the Shuttle Remote Manipulator System grappled the end of the OBSS and took a hand off from the Canadarm2. The OBSS was grappled by the space station arm, because the SRMS could not reach it due to clearance issues, and it needed to be moved out of the way so that the Permanent Multipurpose Module (PMM) could be removed from the payload bay. After the OBSS hand off, the entire STS-133 crew was joined by ISS Expedition 26 commander Scott Kelly and flight engineer Paolo Nespoli for a series of in-flight media interviews. The interviews were conducted with the Weather Channel, WBZ radio in Boston, Massachusetts, WSB-TV in Atlanta, Georgia, and WBTV in Charlotte, North Carolina. The crew also completed more cargo transfers to and from the ISS. Throughout the day, Drew and Bowen prepared tools that they would use on their spacewalk on Flight Day 5. Later in the day, they were joined by the shuttle crew and ISS commander Kelly and Flight Engineer Nespoli, for a review of the spacewalk procedures. After the review, Bowen and Drew donned oxygen masks and entered the crew lock of the Quest airlock for the standard pre-spacewalk campout. The airlock was lowered to 10.2 psi for the night. This was done to help the spacewalkers purge nitrogen from their blood and help prevent decompression sickness, also known as the bends. Steve Bowen and Alvin Drew performed the mission's first extra-vehicular activity (EVA), or spacewalk, on Flight Day 5. After waking up at 6:23 am EST, the crew immediately began EVA preparations. A conference was held between the crew of the station and Mission Control at about 8:20 am, followed by further EVA preparation work, including the depressurization of the airlock. Bowen and Drew switched their spacesuits to internal battery power at 10:46 am, marking the beginning of EVA 1. During the EVA, Bowen and Drew installed a power cable linking the Unity and Tranquility modules in order to provide a contingency power source, should it become required. They then moved a failed ammonia pump, which was replaced in August 2010, from its temporary location to the External Stowage Platform 2. Later, operations with the SSRMS robotic arm were delayed to due technical problems with the robotic control station in the Cupola module. After installing a wedge under a camera on the S3 truss to provide clearance from the newly installed ExPRESS Logistics Carrier-2, performing a Japanese experiment called Message in a Bottle to collect a sample of vacuum, and other minor tasks, the EVA ended after six hours and 34 minutes at 5:20 pm EST. Bowen & Drew (partially obscured at centre) during EVA 1. Bowen & Drew during EVA 1. Flight Day 6 saw the installation of the Leonardo Permanent Multipurpose Module (PMM) to the nadir, or Earth-facing, port of the station's Unity module. Once the installation was complete, the external outfitting of Leonardo, to integrate it into the ISS as a permanent module, was begun. Bowen and Drew conducted the procedure review for the mission's second spacewalk, before beginning their pre-EVA campout in the Quest airlock. Bowen and Drew conducted STS-133's second EVA on Flight Day 7. Drew removed thermal insulation from a platform, while Bowen swapped out an attachment bracket on the Columbus module. Bowen then installed a camera assembly on the Dextre robot and removed insulation from Dextre's electronics platform. Drew installed a light on a cargo cart and repaired some dislodged thermal insulation from a valve on the truss. Meanwhile, the ISS and shuttle crew entered the Leonardo PMM to commence the internal outfitting of the module. On Flight Day 8, the transfer of the Leonardo PMM's cargo to the interior of the ISS began. The crew also received some off-duty time on this day. On Flight Day 9, the equipment used on Drew and Bowen's spacewalk was reconfigured. A joint crew news conference was also conducted via satellite, after which the crew received more off-duty time. The internal outfitting of the Leonardo PMM continued on Flight Day 10. Furthermore, a photo shoot of the ISS with multiple spacecraft docked was considered, but rejected by mission planners. As well as the continued outfitting of the Leonardo Permanent Multipurpose Module, a checkout of Discovery's rendezvous tools was conducted on Flight Day 11, before the shuttle crew said their farewells to the ISS crew, exited the station and sealed the hatch between the orbiter and the ISS. The installation of a center-line camera was also conducted on this day. Discovery conducted its final undocking from the ISS on Flight Day 12, and its last fly-around preceded the final separation from the station. A late inspection of Discovery's Thermal Protection System was conducted using the OBSS, before the OBSS was berthed. The crew of Discovery stowed their equipment in the sle's cabin before conducting a checkout of the flight control system and a hot-fire test of the reaction control system. A final deorbit preparation briefing was carried out before the shuttle's Ku band antenna was stowed. On the final day of the mission, Discovery's crew carried out further deorbit preparations, and closed the shuttle's payload bay doors. A successful deorbit burn and re-entry ended with Discovery landing at Kennedy Space Center's Shuttle Landing Facility for the final time on 9 March 2011 at 11:58:14 EST. The shuttle was retired at wheel-stop. Space Shuttle Discovery lands for the final time, at the Shuttle Landing Facility on 9 March 2011. Video recording of the STS-133 landing. Two spacewalks (EVAs) were conducted during the mission. NASA opened the selection process to the public for the first time for STS-133. The public was invited to vote on two songs used to wake up astronauts on previous missions to wake up the STS-133 crew. ^ "STS-133 Press Kit" (PDF). NASA. Retrieved 21 October 2010. ^ a b "NASA TV "Live Events, Mission Coverage" [STS-133]". NASA TV. 24 February 2011. Retrieved 25 February 2011. ^ "Twitter / NASA:". NASA. 24 February 2011. Retrieved 24 February 2011. ^ "Discovery in Orbit". NASA. 24 February 2011. Retrieved 24 February 2011. ^ NASA (24 September 2009). "Consolidated Launch Manifest". NASA. Retrieved 16 October 2009. ^ NASA (14 October 2009). "NASA's Shuttle and Rocket Missions". NASA. Retrieved 15 October 2009. ^ "Last Flight of Space Shuttle Discovery STS-133". Outer Space Universe. 19 February 2011. Retrieved 20 February 2011. ^ Gebhardt, Chris (5 August 2009). "STS-133 refined to a five crew, one EVA mission – will leave MPLM on ISS". NASAspaceflight.com. ^ NASA (26 February 2010). "NASA and Italian Space Agency Find New Use for Module". NASA. Retrieved 26 February 2010. ^ Chris Gebhardt (6 October 2010). "PMM Leonardo: The Final Permanent U.S. Module for the ISS". NASAspaceflight.com. Retrieved 15 November 2010. ^ Stevens, Tim (14 April 2010). "NASA and GM's humanoid Robonaut2 blasting into space this September". ^ Ron Diftler (18 November 2010). "Robonaut 2 (R2) Overview" (PDF). NASA. Retrieved 12 December 2010. ^ Bates, Daniel (9 December 2010). "Mission accomplished! SpaceX Dragon becomes the first privately funded spaceship launched into orbit and guided back to earth". Daily Mail. UK. Retrieved 9 December 2010. ^ Chris Bergin (19 July 2010). "STS-133: SpaceX's DragonEye set for late installation on Discovery". NASAspaceflight.com. Retrieved 21 July 2010. ^ "Student Signatures in Space (S3)". Archived from the original on 11 May 2008. Retrieved 8 September 2010. ^ "STS-133: What's Going Up". 1 November 2010. NASA. ^ "NASA Assigns Crew for Final Space Shuttle Mission". NASA. Retrieved 20 February 2011. ^ "CBSNews – STS-133 Quick Look 1". CBSNews. Retrieved 20 February 2011. ^ a b "STS-133 launch remains on track as Bowen replaces the injured Kopra". nasaspaceflight.com. 19 January 2011. Retrieved 19 January 2011. ^ a b Tariq Malik (18 September 2009). "NASA Reveals Crew for Last Scheduled Shuttle Mission". SPACE.com. Retrieved 18 September 2009. ^ a b Chris Bergin (15 October 2010). "STS-133: TCDT completed – Engineers troubleshooting leaky flight cap". NASAspaceflight.com. Retrieved 19 October 2010. ^ Matthew Travis (28 October 2010). "All-Veteran Crew Flies To KSC For Discovery's Final Launch". SpaceflightNews.net. Archived from the original on 24 July 2011. Retrieved 1 November 2010. ^ a b "Space veteran to sub for injured astronaut". USA Today. 20 January 2011. Retrieved 28 January 2011. ^ Robert Z. Pearlman (9 September 2010). "Space shuttle Discovery departs hangar for final flight". CollectSPACE. Retrieved 12 September 2010. ^ James Dean (8 September 2010). "Shuttle rollover delayed by water leak". Florida TODAY. Retrieved 12 September 2010. ^ vertical flow refers to the period of time between rollout from the Shuttle Processing Facility and launch. ^ ATK. "STS-133 SRB Use History" (PDF). Spaceflight Now. ^ Chris Bergin (10 September 2010). "STS-133: Engineers complete repair on Discovery following ET mate issue". NASAspaceflight.com. Retrieved 12 September 2010. ^ William Harwood (11 September 2010). "Shuttle Discovery finally bolted to external tank". Spaceflight NOW. Retrieved 12 September 2010. ^ Robert Z. Pearlman (21 September 2010). "Space shuttle Discovery makes last trip to launch pad". Collect SPACE. Retrieved 22 September 2010. ^ William Harwood (18 October 2010). "Technicians working on tiny fuel leak in Discovery pod". Spaceflight Now. Retrieved 19 October 2010. ^ Chris Bergin (18 October 2010). "STS-133: Discovery to undergo unique leak repair to avoid rollback". NASAspaceflight.com. Retrieved 19 October 2010. ^ Chris Bergin (22 October 2010). "STS-133: Crossfeed flange seal R&R complete – OMS reload in work". NASAspaceflight.com. Retrieved 30 October 2010. ^ William Harwood (26 October 2010). "Shuttle Discovery cleared for blastoff next Monday". Spaceflight Now. Retrieved 30 October 2010. ^ William Harwood (2 November 2010). "Shuttle engine controller glitch being assessed". Spaceflight Now. Retrieved 20 November 2010. ^ William Harwood (12 November 2010). "Apparent seal problem found in leaking shuttle vent line". Spaceflight Now. Retrieved 14 November 2010. ^ Chris Bergin (11 November 2010). "STS-133: Closing in on GUCP root cause – ET repair at pad still positive". NASAspaceflight.com. Retrieved 15 November 2010. ^ Chris Bergin (12 November 2010). "STS-133: More cracks found on ET-137 as managers debate forward plan". NASAspaceflight.com. Retrieved 20 November 2010. ^ William Harwood (15 November 2010). "Fourth crack found on shuttle Discovery's external tank". Spaceflight Now. Retrieved 20 November 2010. ^ "Underlying metal cracks found on Discovery's tank". Spaceflight Now. Retrieved 20 November 2010. ^ Chris Bergin and Chris Gebhardt (24 November 2010). "STS-133: NASA managers decide to slip to a NET December 17 target". NASAspaceflight.com. Retrieved 26 November 2010. ^ "Discovery's launch delayed until at least mid-December". Spaceflight Now. 24 November 2010. ^ Denis Chow (24 November 2010). "Latest Launch Delay May Push Shuttle Discovery's Final Flight Into Christmas". SPACE.com. Retrieved 26 November 2010. ^ Bergin, Chris (18 February 2011). "STS-133: FRR approves Discovery's launch for next Thursday". Spaceflight Now. ^ William Harwood. "Shuttle Discovery cleared for blastoff next Monday". SpaceflightNow.com. Retrieved 26 October 2010. ^ a b c "Countdown to Start Sunday for Targeted Launch Wednesday". NASA. Retrieved 30 October 2010. ^ a b "Shuttle Wont Launch Wednesday". Chicago Tribune. 2 November 2010. Archived from the original on 7 November 2010. Retrieved 2 November 2010. ^ "STS-133 coverage". Spaceflight now. ^ a b "Discover scrubbed". Spaceflight.com. ^ "STS-133 Launches on Historic Final Mission for Shuttle Discovery". 24 February 2011. ^ "Crew checks Discovery's heat shield, spacesuits". CollectSPACE. 25 February 2011. Retrieved 26 February 2011. ^ William Harwood (25 February 2011). "'Cryopumping' likely cause of Discovery tank foam loss". Spaceflight Now. Retrieved 26 February 2011. ^ Chris Bergin & Chris Gebhardt. "Discovery launches after dramatic range fix late in countdown". NASASpaceflight.com. Retrieved 25 February 2011. ^ Chris Bergin. "STS-133 – Healthy Discovery completes FD2 inspections on RCC panels". NASASpaceflight.com. Retrieved 26 February 2011. ^ "STS-133 MCC Status Report No. 05". NASA. Retrieved 27 February 2011. ^ Bill Harwood. "Discovery pulls into port for her final space station visit". CBS News. Retrieved 27 February 2011. ^ "STS-133 MCC Status Report No. 07". NASA. Retrieved 28 February 2011. ^ Bill Harwood. "Astronauts having on busy Sunday aboard the station". CBS News/SpaceflightNow. Retrieved 28 February 2011. ^ a b c Gebhardt, Chris. "STS-133: EVA-1 completed; Endeavour Rolls to VAB one last time". nasaspaceflight.com. Retrieved 7 March 2011. ^ a b c Harwood, William (28 February 2011). "Mission extended one day". CBS News. Retrieved 1 March 2011. ^ Harwood, William (1 March 2011). "Proposed Ultimate Space Station Photo Op Rejected". Retrieved 1 March 2011. ^ Chris Gebhardt (11 June 2010). "STS-133: Three Flight Days and two EVAs added to Discovery's mission". NASAspaceflight.com. Retrieved 11 June 2010. ^ "Chronology of Wakeup Calls". NASA. 2 August 2005. Retrieved 5 April 2010. ^ "NASA's Space Rock". NASA. Archived from the original on 10 October 2010. Wikimedia Commons has media related to STS-133.